Baker Perkins has introduced technology to deposit full 3-Dimensional jellies. This is a high-value, high-margin segment of the fast-growing jelly market and depositing is the only method capable of manufacturing these complex shapes at high outputs and with low production costs. 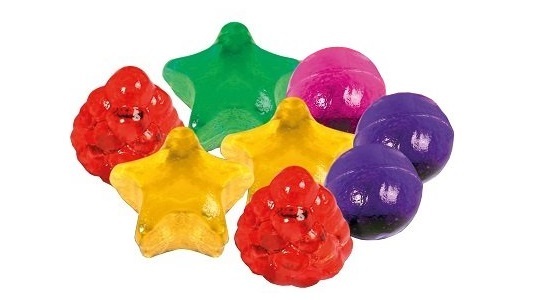 New mould technology that allows rapid and low-cost shape change is the innovation that has brought the benefits of starchless depositing to the 3D jelly market. 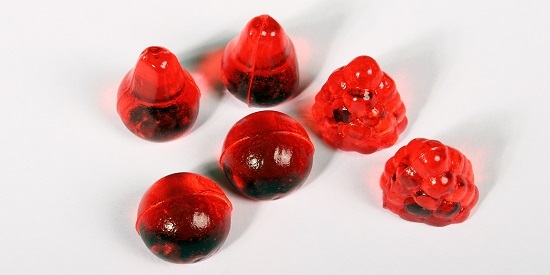 3D jellies can be made in one or two colours; with stripes and layers; with solid or soft centre-fills; and with inclusions such as real fruit pieces. The process uses quick-setting jelly formulations, typically pectin- or carrageenan-based. 3D shapes are not possible with a starch moulding system. Product possibilities include balls or spheres, animals and cartoon characters, and fruit shapes such as raspberries, strawberries and pears. There is great potential for character merchandising linked to television and films. Because of the importance of speed-to-market in this short-term environment, the process of developing a new product ready for manufacture has been compressed. New designs can be visualised and models made very quickly using 3D CAD and 3D printing, which is also used to make test moulds for trials. 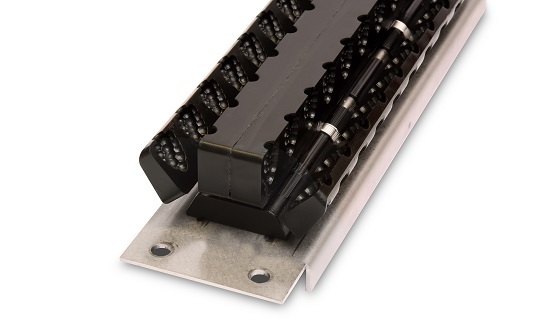 To ensure fast changeover between production runs, the mould system uses a new carrier design with clip-in moulds that allows rapid low-cost product change by replacing just the moulds rather than the complete carrier system. This widens the range of products that a single line can produce, and this versatility may be enhanced by the ability to deposit multiple shapes in different colours simultaneously. A single ServoForm™ depositing line can produce the same product range as a number of smaller low output lines – but at much lower cost. Air ejection from the mould is more hygienic than brush based ejection systems, and ensures the product is undamaged. 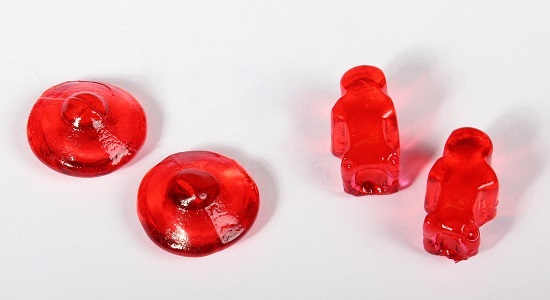 The new 3D jelly concept will appeal to companies new to the market, and established producers wishing to add 3D jellies to their range or with multiple low-output low-efficiency lines. With outputs ranging from 100 to 1,000 kg/hour, initial low outputs can be scaled up. The accuracy and hygiene of modern cooking and depositing techniques ensures that products made using the Baker Perkins ServoForm™ Jelly process benefit from exceptional weight and dimensional accuracy, with no shrinkage, and enhanced definition for intricate product shapes. Accurate positioning of the mould under the depositor nozzle and of the stream of syrup into the mould ensure consistent mould fill with no waste and allow the mould opening to be minimised, achieving a more realistic 3D shape. 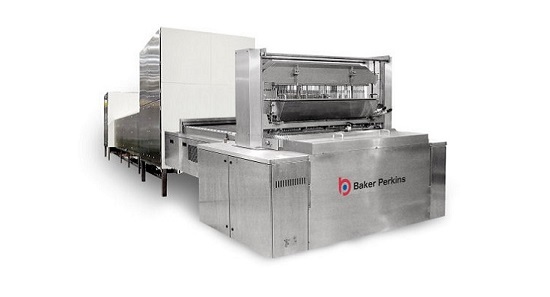 Baker Perkins’ lines for conventional and 3D jellies comprise cooking, depositing and cooling. The products are deposited at final solids so no drying is required. As an alternative to starch moguls, starchless depositing is significantly more cost-effective in every aspect: capital cost, floor space, energy consumption, labour and consumables. It is also completely hygienic with a fully automatic wash-through function, non-contact ejection system and no recycling of starch. 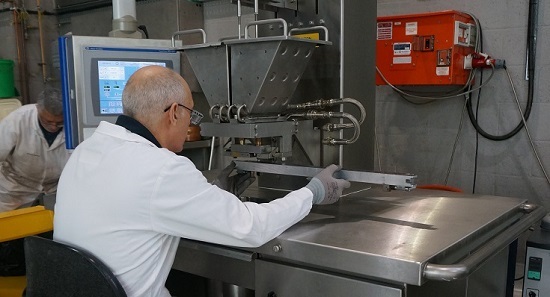 Baker Perkins offer process knowledge and support, including an Innovation Centre for process and product trials, where any ideas for new 3D shapes can be explored.